CRAS 24/7 is a cloud platform that helps you to monitor and manage the health of edge security devices like surveillance camera’s and video encoders. Never loose valuable data or video evidence. Know the state of your security. Know when surveillance camera’s crash. Receive via e-mail and SMS device alarm notifications and device status updates. CRAS 24/7 offers historical data and management reports from all of your monitored devices, users and locations. Unlimited locations and devices. You can monitor an unlimited number of locations, sites and devices. Manage all devices, users, alarms and locations via the user friendly dashboard. Supported brands. CRAS 24/7 integrates with edge security devices like ip surveillance camera’s and video encoders. We support major brands like Axis, Avigilon, Mobotix and Dahua. Pay as your grow. 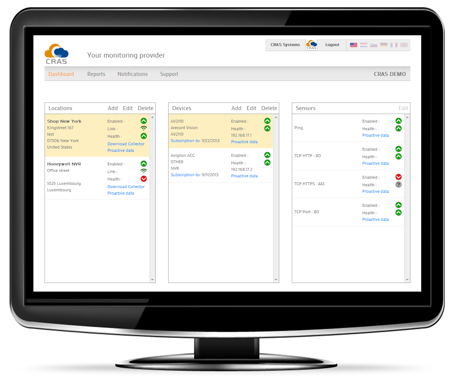 CRAS 24/7 is a SaaS cloud service, no yearly or monthy subscription or account fees. We avoid complicated “per channel” costs, we support pay as you go. Appliance Free. No on-site engineers or extra hardware required to monitor the health of your security network, systems and edge devices.